The Crown is beautifully tailored, both the writing and production flow, bringing into our homes a real-life tale of what it really takes to be Queen Elizabeth II. Purchasing this Blu-ray for your home is a definite must! Netflix has created an empire all unto themselves with their Netflix originals- both with their movies and television series. A unique feature of Netflix is that they refuse to release their shows on a weekly basis, letting their viewers binge the show all at once. Thank goodness for that, because The Crown, a story about Queen Elizabeth's life, love, and country, is so captivating that once you finish the first episode, you won't want to stop. 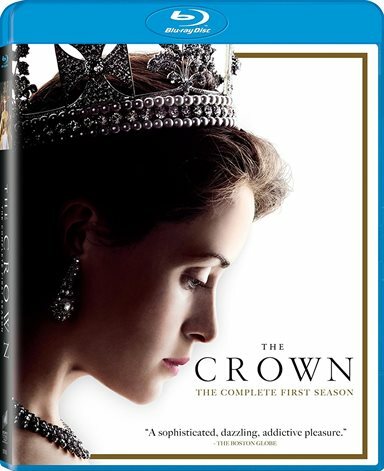 In fact, this is such a captivating series that The Crown was the recipient of Three Emmy Awards, including Best Supporting Actor in a Drama Series. The Crown chronicles Queen Elizabeth II"s (Claire Foy; Season of the Witch) life beginning from the time when she was just the King's daughter and marrying her sweetheart, Philip, the soon to be Prince Philip (Matt Smith; Doctor Who). Season One takes us through their marriage, the first ever live broadcast of a Coronation, the political aspect of their marriage, and the personal ups and downs of their marriage. A unique understanding of Elizabeth is provided- the understanding that the Crown is Elizabeth- that there is no separation of woman or country. Claire Foy plays Elizabeth II. Foy's performance is brilliant. When happy, her entire persona shines. When displeased, her body language shows her displeasure without losing the regality that she exudes. Foy starts out as a happy girl, one who does not yet feel the weight of an entire nation on her shoulders. She is a newlywed and seems to be enjoying her marriage to a man who is clearly in love with her. Foy's performance from the happy go lucky ambassador to Queen upon hearing about her father's death is outstanding. The audience can see the clear-cut transition that happens as she realizes that she is now the Queen of England and her father is dead. It's almost as if the innocence Foy had in her performance was stamped out with this huge responsibility. From that point on, in Season One, you can see Elizabeth's struggle with trying to balance being a wife and a Queen and what an everyday struggle it is. In addition to being a wife, she also is still a sister and a daughter, which, as Foy shows, she finds very difficult to simply be. Matt Smith is everything you hope a Prince will be. Smith is absolutely charming as Prince Philip and provides a greater depth of knowledge as to what it must be like married to the world's most powerful woman. He married the love of his life knowing, but not really knowing, what it will be like when she becomes Queen. Smith at times, plays the wounded husband, hardly something women of today can relate to, but he is still charming that we feel horrible for what he goes through. Married to The Crown, Philip faces the fact that no matter what he does, he will never be his wife's equal or her partner in life. Smith's reactions when he realizes that his wife is "Your Queen first" is gut-wrenching and heartbreaking to watch. Even when Smith portrays a callous and partying Philip, we still don't lose sympathy for his character. Since the main storyline is the relationship between Elizabeth and Philip, one must comment on the chemistry between these two actors. The screen does not sizzle, as it is the 1950's and 60's and there is certain decorum to be maintained when Royalty, but in the first half of the season, Foy and Smith seem very much in love. At first, it seems as if it is a careless love- fresh, new, bright. During the season, their chemistry begins to change and you can see the deepening of their relationship to almost an utter despair of not knowing whom each other is. This is pivotal to the development of the characters and the storyline and to the continuation of the series. One of the main aspects explored is the relationship between Queen Elizabeth and Prime Minister Winston Churchill, who is played by John Lithgow (Interstellar). Lithgow plays the Prime Minister in a period of his life when it is questioned if he should be Prime Minister. For him, having the support of the Queen is central to his maintaining his position in the Government. Likewise, he undertakes the new Queen as if she is his to mold- almost a father-daughter or teacher-student relationship more so that Queen and Subject. Lithgow's lines are well written and well executed to the point that you cannot stop wanting more of his performance. Lithgow is simply an amazing actor and his Emmy Award is well deserved. The Blu-ray is presented in High Definition 1080p with an aspect ratio of 2.00:1. The picture quality is pleasing to the eye. Colors are crisp and bright. Dress colors pop, as well as the glitter of the jewels on the crown, but nothing seems overdone. Hues and shades are natural and do not have an over-synthesized feel to them. The best scene was one in which Elizabeth and Philip spent a night in the middle of the jungle in Africa. The details of the animals and the safari are beautifully done. The audio is presented in Dolby Digital 5.1. Background noises are appropriate and intonations are clearly heard. Between Foy and Smith, not one spoken emotion is missed. You can even hear Princess Margaret's inhale and exhale when she is smoking as well as the water in Churchill's bath splashing. The Crown is a series about Queen Elizabeth and her struggle with love, politics, and coming to terms with who she really is – The Crown. Beautifully tailored, both the writing and production flow, bringing into our homes a real-life tale of what it really takes to be Queen Elizabeth II. Purchasing this Blu-ray for your home is a definite must! For more information about The Crown visit the FlickDirect Movie Database.